12 Inch Barrel Length Slight Endload 2-Piece, 100% Composite Design Approved for play in USSSA, NSA and ISA 1 Year Manufacturer's Warranty. 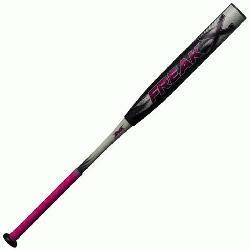 The Miken Freak X is geared specifically for the women’s game. A short 12 inch barrel paired with a slight endload delivers the perfect balance of performance and feel to deliver results on each swing. Comes with a 1 year manufacturer's warranty from Miken. - 12 Inch Barrel Length - 2 1/4 Inch Barrel Diameter - Slight Endload - Triple Matrix Core Technology - Flex 2 Power (F2P) Technology - 100 COMP Technology - 2-Piece, 100% Composite Design - Approved for play in USSSA, NSA and ISA - Made in the USA - 1 Year Manufacturer's Warranty.